It's been awhile since I've popped in here to share anything, but I've been working on my studio to update it with better lighting and a ceiling and cleaner look. There were many times I searched the forum on ideas for lighting. My situation is that I'm in a basement with no windows and low ceilings. Thank you for all your help. Loaded with ideas about fluorescent tube lighting, Deloa's lighting system, track lighting, pot lights, etc., I finally decided on pot lights that could be set in between the rafters, thus allowing the drop ceiling to remain as high as possible. We put lots of pot lights in - 29 to be exact. There are 4 BR30's in the main part of the room and 4 above the table providing good all over light. Then there is a row of 4 GU10's on either side of the table pointing towards the table. The row of pot lights above the table and the 2 rows of GU10's on either side are on their own sets of dimmer switches (3 dimmer switches - one for each row) allowing me to control where the light is coming from depending on which side of the table I'm working at and what type of quilting I'm doing. I'm working on my first quilt with the new set up today! You can see the pictures of the progress of my studio from 2005 to current here. Wow, Caroline, what a transformation! Looks like a great work area and very organized! Lots of hard work and planning that you're sure to enjoy for many years! Congratulations! Looks awesome! I am jealous of all the organization, I love my space just wish I could get it organized and clutter free. Hope you enjoy your wonderful space. That looks awesome! I'm jealous too. Wow! 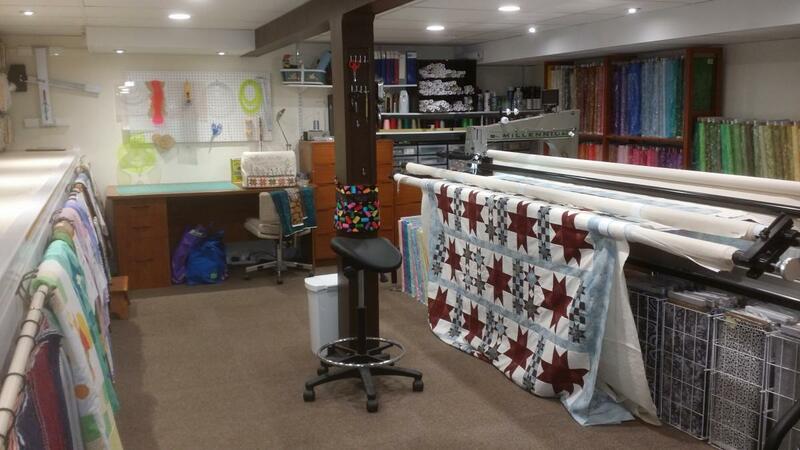 You created a very cheerful quilting area! The lights really made a difference! It looks wonderful! You've got your own fabric store too!. I'm curious...how deep is the area that holds fabric above your long countertop where you have quilts hanging ready to quilt? That is so super cool! It makes me want to go down and at least clean up the piles of stuff in my quilting studio. Your lighting sounds great with the dimmer switches. You should be able to get some good side light for those pesky quilts where the thead just disappears into the patterned fabric. It took me serval years to finally figure out I needed to turn off ALL the lights and just light from the side for those fabrics! I just kept throwing more light n the quilt! Quilting with my Millennium and playing with my Quiltazoid! Love it! I'm looking at moving and having a basement studio myself. Great space and lots of ideas! Thanks for posting. Very nice room and so clean. I'm glad to see I'm not the only person to figure out to hang their quilts in front of their cutting table. It's a great way to display the quilts and it covers up all the crap I have stored under the table. To answer some questions - Yes, I do also sell fabric. The area above the quilts on display (work orders) is a cement ledge that was built in the basement when we moved there. I wish it were a table where I have room to store underneath, but it's not. We're not sure why that area wasn't excavated when the original work was done - we thought maybe it was a big rock or something (or maybe Uncle Albert's tomb )! We covered the front of the ledge with beadboard to give it a clean look and then hung dowels on hooks for hanging quilts. I can get a lot of quilts hung up that way. The ledge on top is about 4' deep and therefore the fabrics sit lengthwise. The shelves are from Costco - two 6' shelves that we used as 5 shorter shelves - we were able to cut the shelves to any height we wanted with a pipe cutter. My contractor had great ideas and showed me how to cut pipe!. Another great idea he had was to put pegboard up when he enclosed the steal support beam. On the other beam he added the light switches and an electrical outlet, fairly high off the floor which I used for easily plugging in the vacuum when cleaning..
You've got a serious thread collection. I don't know that I'll ever be as organized at that! Thanks for sharing pictures. It's quite a transformation.